After travelling the world, the ancients felt a need to put their knowledge into a simple overall view. They first looked for the borders of the inhabited world (oikoumene) and described it as a circular island in the middle of an external ocean according to the Homeric concept that survived two millennia until the Middle Ages. Anaximander of Miletus is considered to be the first to draw a map of the world around 550 BC. He was followed by Hecataeus, also from Miletus (Geus, 2018). Typical world-map of around 500 BC, based on Hecataeus of Miletus telling about his travels around the world (‘periodos’ or ‘periplous’). This T-O map is oriented with the North upside. The ‘T’ is the Mediterranean, the Nile and the Don (formerly called the Tanais) dividing the three continents, Asia, Europe and Africa, and the ‘O’ is the encircling ocean. Jerusalem (or Delphi, or Rhodes) was generally represented in the centre of the map (Wikipedia). In addition, the ancients realised around 350 BC that the oikoumene was located on the surface of a sphere (3-dimensional) and that putting this on paper (2-dimensional) would require some kind of geometrical projection. Strabo suggested that such a map would be shown best on a 10 feet diameter globe (Strabo, 2.5.10, around 10 BC). This was not only a very large object, but it was also quite useless as the oikoumene covered only a small part of its surface. A good reason why none survived (if such a globe was ever built). 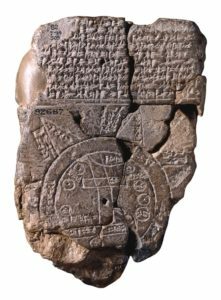 Imago Mundi clay tablet, showing the Babylon area, ca. 6th c. BC, found by H. Rassam in 1882 at Sippar (Irak), (0.122 x 0.082 m, top is North), (British Mus. N° 92687). 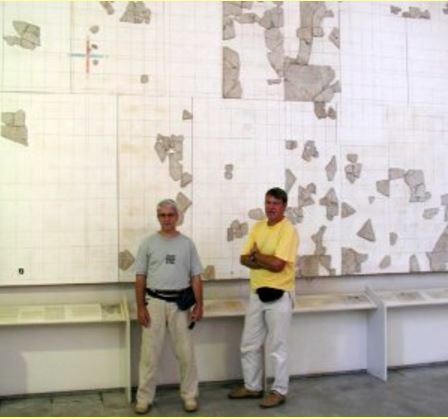 Marbres d’Orange tabula, showing the cadastral map of the Roman colony Julia Firma Arausio Secundanorum (77 AD) consisting of three maps, and showing André Piganiol (1962) (the largest is 7.56 x 5.90 m) (Orange Mus.). 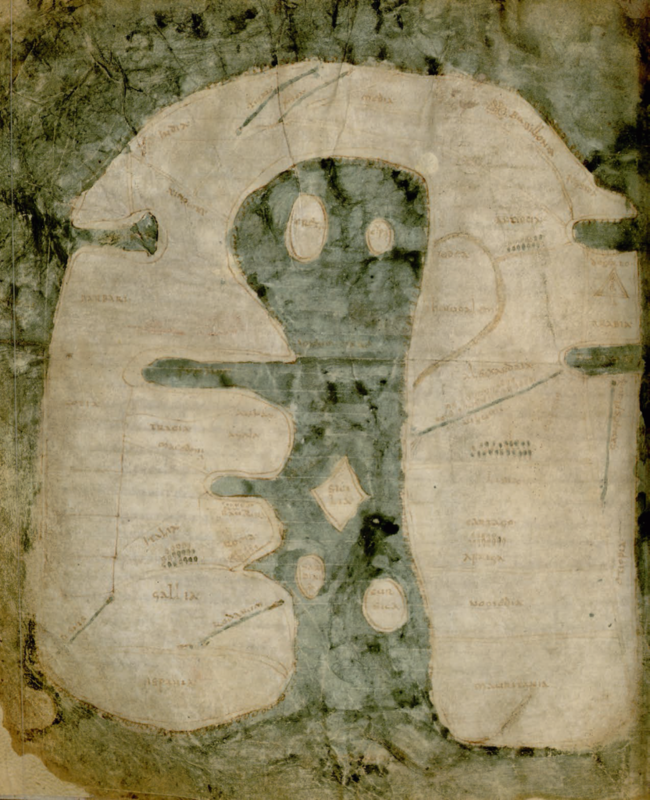 Albi’s mappa mundi, from an 8th century manuscript found in the St Cecilia cathedral of Albi, France (0.27 x 0.225 m, top is East) (A. Dan, 2017). 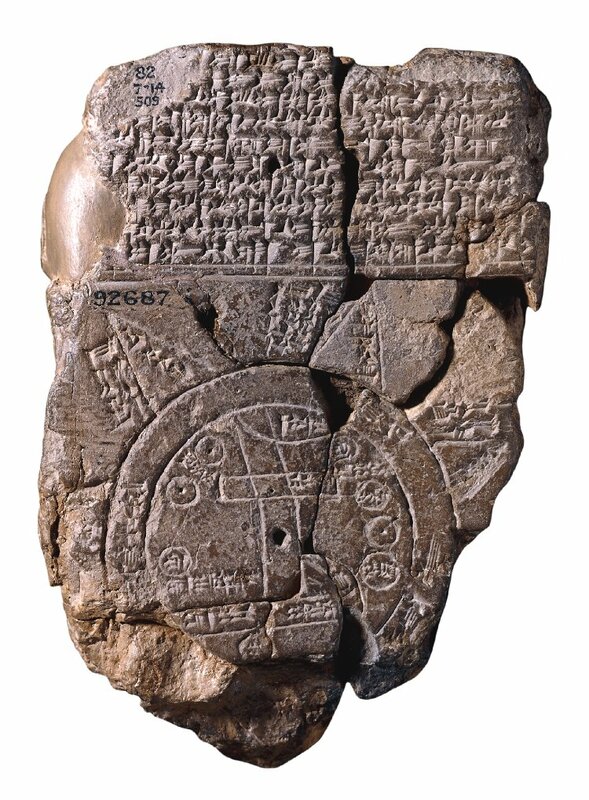 All other ‘ancient’ maps we can see today were redrawn based on ancient texts without any drawings: e.g. the remains of the ‘map’ of Agrippa consist of text only and his monumental Porticus Vipsania did not survive (if it was ever built). Agrippa’s work is dated around 15 BC and mentioned by Pliny around 77 AD. It was probably used for the Cottoniana around 1000 AD and used at Ebstorf around 1235 AD and Hereford around 1300 AD (Arnaud, 1990, pp 1279-1298). 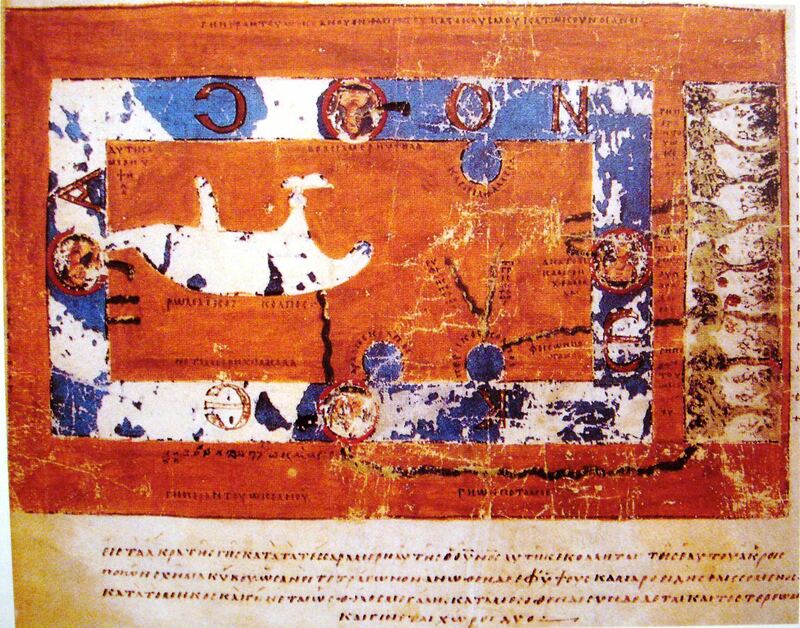 This is also the case for all maps based on Ptolemy’s tables of coordinates which were forgotten for a long time, which reappeared in Constantinople around 1300 thanks to Maximus Planudes and which proved to be (by far) the best representation of the oikoumene until the Middle Ages. Information provided by ‘itineraries’ written by travellers surely had a lot of influence on these maps, even if this information could not be retrieved as such on them (Arnaud, 2007). The famous Peutinger map (Tabula Peutingeriana) from the 13th century was found in 1507 by Conrad Celtis and given to his friend Konrad Peutinger in 1508. In contrast with the maps mentioned above, it might be called ‘1-dimensional’ because of its distorted and linear aspect fitting the ancient scrolls (the size of the Peutinger map is 0.34 x 6.75 m). It was probably based on late 4th century Roman itineraries (Emperor Julian the Apostate, acc. to Arnaud, 1990, p 945 & 916), themselves inspired by others such as the Antonine Itinerary (around 350 AD, for the non-maritime parts, and between the 4th and the 6th century AD for the maritime parts, acc. to Arnaud, 2004). Portolans provide information for seafarers sailing from port to port. A portolan consists of a marine chart with port names and 16 rhumblines (directions), and of written nautical instructions. Some charts are still available: the oldest known chart is the “Carta Pisana” dated around 1300 AD. The oldest known portolan (but chart is missing) is the “Liber de Existencia Riverierarum et Forma Maris Nostri Mediterranei” dated around 1200 AD and studied by Patrick Gautier-Dalché in 1995. Note that early portolan charts were drawn before Ptolemy’s coordinate system was rediscovered in the 14th c. It was Gerardus Mercator who brilliantly combined portolan charts with Ptolemy’s system in 1569. Portolans and the Peutinger map can perhaps be seen as the outcome of a long evolution of itineraries starting with the much older Stadiasmus Maris Magni (around 150 to 50 BC? ), Pseudo-Scymnos (between 133 and 110 BC, acc. to Marcotte, 2000), Pseudo-Scylax (around 330 BC, acc. to Wikipedia) and Scylax of Caryanda (around 515 BC, acc. to Wikipedia), Hanno the Navigator (around 600-400 BC? acc. to Wikipedia). astronomers (“geographers”) had a full 3-dimensional view. and relied mainly on textual descriptions of their world. Many ancient cartographers aimed at providing as much information as possible on place names, roads, tribes, mountains, rivers, etc. and therefore had to distort their maps to include this information, like e.g. increase the size of densely populated areas and reduce the size of deserts (see Ptolemy, Geography, 8,1). Many cartographers (possibly including Agrippa) had a political approach trying to show an impressive number of conquered cities and tribes to please a proud emperor and to impress the people, while Ptolemy had a scientific approach looking for an accurate map. The answer found by Ptolemy (around 160 AD) and his predecessors (Dicaearchus around 300 BC and Marinus of Tyre around 100 AD) by suggesting subdividing the world into parallelograms defined by meridians and parallels, introduced the idea of modern atlases. However, his idea could only be put into practice when the ancient papyrus scroll (volumen, several meters long, but with no more than 25 to 35 cm height) was replaced by the larger parchment codex (menbrana, with a maximum size of up to 70 x 40 cm) around the 6th century in Europe, although it was already used in Asia Minor during the Hellenistic period. Note that the Roman wooden wax tablets used for writing were obviously far too small for maps. In addition, ancient texts and maps had to be copied at regular intervals to be preserved over time. This was done by more or less knowledgeable people who often tried to ‘improve’ the document by adding or changing information. The maps resulting from this process were therefore closer to an ‘evolution’ than to a simple copy. was solved in 2004 by Google Earth’s revolutionary zooming tool. One might say that both Eratosthenes and Ptolemy had it right from the onset, but that it took a millennium or so to have their vision of the oikoumene widely accepted. Ptolemy’s work consists of a list of 6345 place names in the Roman Empire of the 2nd century AD (Stückelberger & Graßhoff, 2006). Each place is located with latitude and longitude aiming at enabling a reconstruction of the complete map of the world he was living in, but it is believed that he probably never published a drawing of such a map. His latitudes are related to the equator, like we do today, and the value of one minute of latitude is 1852 m (or one nautical mile, by definition). 0.97 nautical mile near Massawa and Dakar, or 1790 m at 15° of North latitude. His reference point for longitudes is located around 20° West of Greenwich which is today’s reference. However, a shift increasing towards the East is observed: shift of 20-22° in France, around 25-30° in Greece and 35-40° in the Red Sea. It appears that he also underestimated the value of one degree of longitude. This subject has been discussed for nearly two millennia (!) … Without entering into this discussion, it appears quite clearly that Ptolemy’s “errors” might be corrected by a combination of a shift and a reduction factor. We have therefore carried out an analysis (called linear regression) on a sample of 42 well known coastal sites by comparing Ptolemy’s latitude-longitudes with the present values. Comparison of Ptolemy’s longitudes and latitudes with real values. Ptolemy’s longitudes (left figure) and his latitudes (right figure) are set out horizontally; the real latitudes and longitudes are set out vertically. It can be seen first that the points are quite well aligned on straight lines (regression coefficient R2 is nearly 0.988) which shows that the mathematical formulation (“y = ax + b”) is correct. The straight line for latitudes shows that Ptolemy’s values are, globally, equal to the real values (factor 0.9559 close to 1 and shift of 120.98 minutes; that is still 2°). In other words, Ptolemy’s reference point is at 14° West of ours (Greenwich), which leads to the Canary Islands which are between 13°30’ and 18°, but not to the Cape Verde Islands which are between 22°30’ and 25°30’. Apart from this correction of 14° for the reference point, Ptolemy’s longitudes are still too large and a fraction of only ¾ (factor 0.75) must be taken. These figures would probably be confirmed with a larger sample of places than the 42 taken here. A possible explanation is that Ptolemy erroneously chose to assimilate one degree of longitude with 500 stadia (as suggested by Marinus of Tyr) ,leading to a circumference of the earth of 180 000 stadia, instead of nearly 700 stadia (as suggested by Eratosthenes), leading to a circumference of 250 000 stadia. The latter yields a circumference of 39 375 km if Egyptian stadia of 157.5 m are used and this is very close to today’ accepted equatorial value of 40 075 km. The accuracy of Ptolemy’s latitude-longitudes is thus not very high. Basically, and as shown above, latitudes are more accurate than longitudes as they can be checked with the Sun’s positions, while longitudes (without chronometers) must be deduced from distances reported by travellers. It was shown above that Ptolemy’s latitudes can easily shift by one or two degrees (around one hundred minutes in the figure above). It is noted also that all of Ptolemy’s figures for degrees of latitude and longitude are given with a smallest approximation of 1/12° or 5 minutes, in the oldest available manuscript of 1460-1477. In the 1562 manuscript, the translator provides figures in degrees and minutes and the latter are all multiples of 5. This indicates an estimated accuracy to + or – 2.5 minutes (around + or – 2 nautical miles). Ptolemy was therefore very optimistic on his accuracy! NB: some “6”s are found on the lists and may probably be considered as copyist confusions between a “5” and a “6”. I therefore took the liberty of replacing “6” by “5”. As a conclusion, Ptolemy’s work allows us to position ancient ports based mainly on their latitude. It may be of interest to compare the longitudes of some places, but only within a short distance. ARNAUD, P., 2014, “Mapping the edges of the Earth: Approaches and cartographical problems”, Colloquia Antiqua, 12, ed. A. Podossinov. 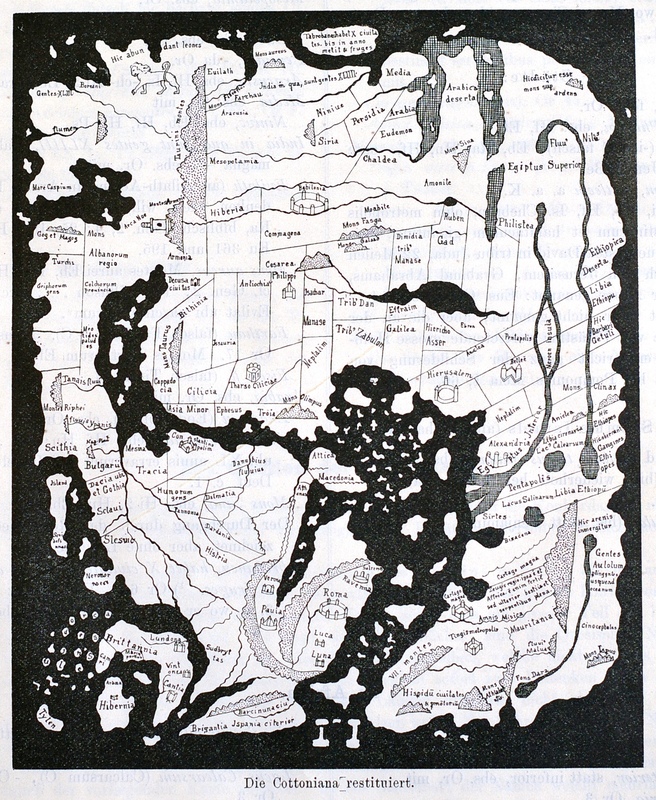 ARNAUD, P., 1990, “La cartographie à Rome”, Thèse d’Etudes Latines pour le Doctorat d’Etat réalisée sous la direction de monsieur le professeur Pierre Grimal, Université de Paris IV. BUCCIANTINI, V., 2012, “The limits of knowledge : explorations of and information from the Horn of Africa to the East African coast in the Graeco-Roman tradition”, Topoi, Suppl. 11, 2012. DAN, A., 2017, “La mappemonde d’Albi – un pinax chôrographikos”, Cartes & Géomatique, Revue du Comité français de cartographie, N° 234, Déc. 2017. DAN, A. & RUI, L., 2018, “Qui a inventé la carte ? Quelques remarques sur les plus anciennes représentations des espaces d’Occident et d’Orient”, in Michel Espagne, Li Hongtu (éds), Chine France – Europe Asie. Itinéraires de concepts, Paris, 2018, p. 133-174. 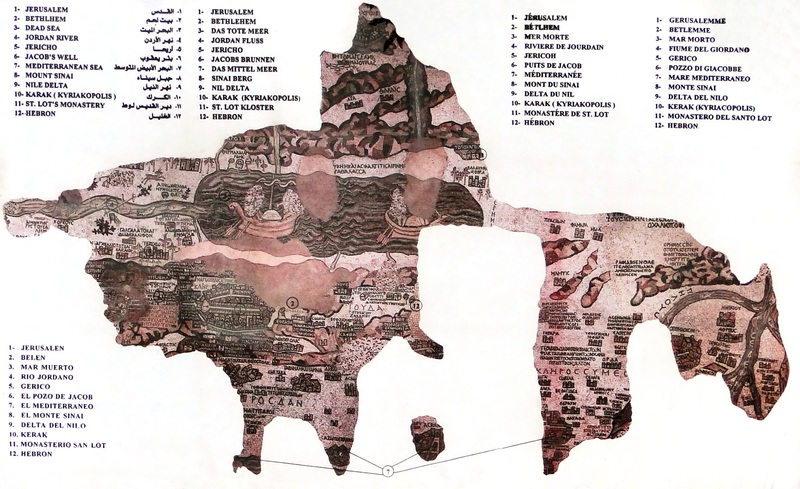 DILKE, O., 1987, “Cartography in the Byzantine Empire”, The History of Cartography, Vol. 1, Chicago. FORSTNER, G., 2004, “Längenfehler und Ausgangsmeridiane in altenLandkarten und Positionstabellen”, Dissertation, Universität der Bundeswehr München. GAUTIER DALCHE, P., 1995, “Carte marine et portulan au XIIe siècle. Le Liber de Existencia Riverierarum et Forma Maris Nostri Mediterranei (Pise, circa 1200)”, École Française de Rome. 326 p. (Publications de l’École française de Rome, 203). GEUS, K., 2018, “Greek and Greco-Roman geography”, in The Cambridge History of Science, Vol. I, Ancient Science, Cambridge University Press. ISAKSEN, L., 2011, “Lines, Damned Lines and Statistics: Unearthing Structure in Ptolemy’s Geographia”, 6th International Workshop on Digital Approaches in Cartographic Heritage, The Hague, 7-8 April 2011. MARX, C., 2016, “The western coast of Africa in Ptolemy’s Geography and the location of his prime meridian”, Hist. Geo Space Sci., 7, 27–52, 2016. RUSSO, L., 2013, “Ptolemy’s longitudes and Eratosthenes’ measurement of the earth’s circumference”, Mathematics and Mechanics of complex systems, Vol. 1, No. 1. SHCHEGLOV, D., 2004, “Ptolemy’s system of seven climata and Eratosthenes’ Geography”, Geographia Antiqua 13 (2004), 21–37. A. STÜCKELBERGER, A. & G. GRAßHOFF, G. (editors), 2006, “Klaudios Ptolemaios Handbuch der Geographie”, Basel. TUPIKOVA, I. & GEUS, K., 2013, “The Circumference of the Earth and Ptolemy’s World Map”, Max Planck Institute for the History of Science, Berlin / TU Dresden & FU Berlin. Claudii Ptolomei Cosmographie: Codex Valentinus, translation by Jacobus Angelus, Italy, 1460-1477. Geographia Cl. Ptolemaei Alexandrini : olim a Bilibaldo Pirckheimherio traslata, at nunc multis codocibus graecis colata, pluribusque in locis ad pristinam veritatem redacta a Josepho Moletio mathematico, 1562.